Yeee haw, cowboy! Time to mount that steer and prove you know how to ride 'em with the best. Can you top the beast before the beast tops you? There's a reason bull riding is called the most dangerous eight seconds in sports. Because that steer is mighty mad, and is gonna do everything he can to teach you a lesson about manners. That includes using his sharp horns to spear you or using his thousands of pounds to smash your body into mush. Who wants to take all those risks? It's too much risk. You don't want to break any bones or feel the end of a bull horn, do you? We're not rodeo clowning around about this either. So find the safer alternative and just wear this costume! Yes, your friends will be delighted and amazed at your bravery as you tame this inflatable longhorn. 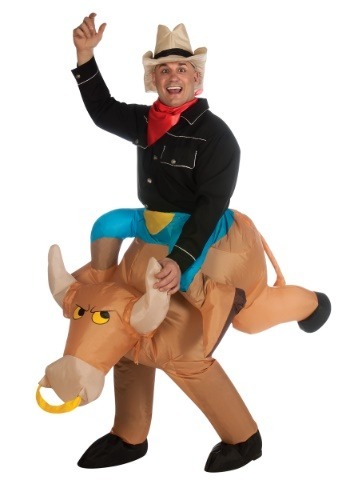 Sorry to say, they will probably know it's not a real bull, but that won't make it any less impressive as you ride him through the room (Okay, it's probably a lot less impressive than an actual bull, but do you really want to bring a bull into a tiny enclosed space?). Eventually the bull will tame, but you've got to wear it out of him first. You and the bull can take a bow as everyone marvels at your abilities. "That's the bull whisperer," they'll whisper about you, which is funny because they'll be the bull whisperer whisperers. But you'll be too busy proudly riding your steer. Because no matter how hard he bucks, you're safe. You are actually joined because your legs are his legs and he's inflatable. You did it, cowboy.